Sacred natural sites such as forest groves, mountains and rivers are arguably the world’s oldest form of protected areas. These sites can be found in almost every country and culture, and they play a vital role in the informal conservation of both biological and cultural diversity. A number of international organizations including the Secretariat to the Convention on Biological Diversity and the United Nations Educational, Scientific and Cultural Organization (UNESCO) have developed guidelines to promote the recognition, preservation and restoration of sacred natural sites. The idea is to integrate traditional knowledge and cultural practices with the protection of the physical environment, thus extending conservation efforts beyond official protected areas. Despite the progress made at the international level, challenges remain as to how to develop contextualised local strategies to maintain the cultural and ecological integrity of such sites, which are increasingly under pressure from rapid socio-economic changes. Sacred natural sites in developing countries are particularly susceptible to the negative impacts associated with infrastructure development, tourism, commercial farming and, above all, secularization. The concern here is not only with whether such sites can survive but also with how they can adapt and thrive amid changing socio-economic conditions. The Sani people living in the Shilin Yi Autonomous County in China’s southwest Yunnan Province have some inspiring stories to tell. Shilin, literally translated as Stone Forest, is known for its spectacular pinnacle karst topography with tree-like rocks rising up from the ground. It is part of the South China Karst UNESCO World Heritage Site, inscribed in 2007. As one of the major tourist attractions in Yunnan, Shilin draws millions of visitors from China and abroad each year. 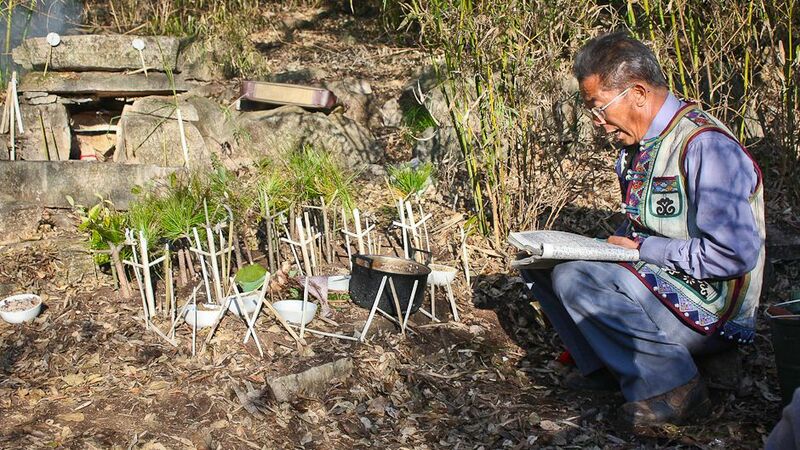 What is less well known, however, is that the Shilin region is also home to patches of sacred groves where the Sani people worship their local deities including the Mizhi God. The word “Mizhi” is a transliteration of the Sani language, and is associated with the ideas of community protection, prosperity and bountiful harvest. Although variations exist between the practices of different Sani communities, the Mizhi Festival usually takes place for seven consecutive days in the eleventh month of the Chinese calendar. The festival starts with a one-day ritual ceremony at the sacred grove where a group of eligible male adults, headed by a shaman or bimo, conduct ritual services and offer sacrifices to the Mizhi God. At the conclusion of the ceremony, the sacrificial food is distributed and shared among all villagers. In the course of the Mizhi Festival, all agricultural activities are forbidden, as it is believed that the Mizhi God is patrolling the cropland. An offence is likely to cause misfortune to the family and community. As a way of spending idle time, the males opt for hunting and fishing while the females enjoy doing embroidery and sewing. The week-long religious event is of most importance to the Sani people as it helps not only to foster community bonds but also promote guardianship of sacred groves and related customary laws and practices. The faith-based management system has played a vital role in the protection of the environment and the continuation of cultural practices and identities. However, it is a challenge to maintain the culturally and ecologically enriching traditions of stewardship. The past five decades have witnessed both positive and negative transformations of the Sani village groves. China’s Great Leap Forward (1958-61) once took a great toll on the forest patches, with many of the tallest and oldest trees cut down to fuel steel-making furnaces or for making rolling vehicles. The ensuing Cultural Revolution (1966-76) caused further damage to forest ecosystems and brought the local belief system to the verge of collapse. The worshipping of the Mizhi God inevitably fell victim to the attack on what was known as the “four olds” (old ideas, old culture, old customs and old habits). It was not until the early 1980s that the government lifted the ban on the Mizhi Festival. Despite growing government acceptance of folk religion, forest ecosystems in Sani villages continued to deteriorate. Shortly after the introduction of the agricultural “household responsibility system” in 1981 — which partially supplanted the egalitarian distribution method and allowed peasants to sell what they grew beyond a reduced quota in a free market — a new wave of land clearing began to make way for high-yielding crop cultivation. More recently, commercial farming has spread across the region in response to growing market demand for cash crops such as tobacco. The rapidly changing socio-economic conditions have placed unprecedented pressure on traditional ways of life and on the physical environment supportive of local livelihood. As more and more young villagers move to the cities in search for better jobs and education, it has become increasingly difficult to preserve cultural heritage and social customs. Many traditional values are also in danger of being lost with the penetration of media and communications technologies. These factors have led to the weakening of the bonds between communities and their land, which adversely affect the physical integrity of sacred groves. To address these challenges, an integrated approach was developed with the aim of engaging multiple stakeholders in the preservation and revitalization of traditional cultural practices and resource management systems. In 1998, Yunnan University, with the financial support from the Ford Foundation, launched a pilot project to explore a new model of community-driven rural development, entitled Minzu Wenhua Shengtai Cun (or Ethnic Eco-cultural Village in English). Under the leadership of anthropology Professor Shaoting Yin, the project sought to create synergies between local communities, scholars and government agencies in improving rural livelihoods and the environment. Participating villages were seen neither as subjects of anthropological research nor as passive beneficiaries of government poverty reduction programs. Instead, they were given the driver’s seat to find what works best for their community by engaging in the appraisal of traditional knowledge and culture. The project team, made up of scholars trained in anthropology and other disciplines such as ethnobotany and architecture acted as advisors and coordinators. Likewise, the local government limited its role to providing policy and financial support. Six villages in Yunnan Province were chosen as pilot villages, from which Yuehu (Moon Lake) Village in the Shilin region stood out for its well-preserved forested landscape. Located a few miles away from the Stone Forest tourist zone, Yuehu Village can be readily accessed by public transport. Despite its vicinity to urban areas, much of Yuehu’s traditional practices have survived the drastic changes over the past half-century. This can be largely attributed to the village’s spiritual resilience and social fabric of unity maintained through kinship and community ties. The forested land is a mosaic of sacred sites and places of worship. Through the Mizhi Festival and seasonal ritual activities performed at particular sites of spiritual significance, the villagers of Yuehu have developed a sense of group identity and an intimate relationship with their land. To highlight the importance of cultural beliefs in vegetation protection, the project team embarked on the survey and documentation of traditional knowledge in the Yuehu Village. Retired Sani teachers were trained to write course materials based on their own knowledge and experience. They were also asked to conduct surveys on tangible cultural heritage through visits to every household. Over 170 items were recorded with owners’ details, which helped to promote awareness and protection of local cultural heritage. In order to strengthen the stewardship of forest reserves, the Villagers’ Committee drew up codes of conduct including financial penalties for transgressing behaviours. Another initiative undertaken was to mark out sacred sites and places of worship with wooden labels and stone-built walls. Pathways connecting these sites were built with great care to avoid disturbance to the natural environment. After the expiration of the pilot project in 2004, the villagers of Yuehu continued their efforts to mobilize resources for community development. The Shilin county government responded by providing financial assistance for improving infrastructure and cultural facilities. In 2005, Yuehu Village was among the first to be included in the Shilin government’s program of developing ethnic eco-cultural tourism, known as Ashima Minzu Wenhua Shengtai Lvyou Cun (or Ashima Ethnic Eco-cultural Tourist Village in English). The program capitalizes on the rich cultural heritage of selected villages, aiming to preserve its cultural and ecological landscape through maximizing tourism’s contribution to environmental protection and poverty alleviation. This ongoing project is now the responsibility of the Shilin county government’s Bureau of Ethnic and Religious Affairs and Bureau of Culture and Sports. Bureau staff have been involved in the pilot project since 1998 and have accumulated know-how through trial and error. They are now applying the know-how to other Sani villages including Danuohei Village. Danuohei is known for the rustic look of its flagstone-built houses. Along the external walls of these two-level terrace houses, stock barns, corrals and animal-feeders are built next to each other, forming an integral part of the traditional agricultural landscape. By working with Bureau staff and academics from Yunnan University, Danuohei villagers have built flagstone-paved pathways connecting their own yards to the main village roads. The stone-built fence surrounding the Mizhi grove is another attraction for outsiders. Besides infrastructure improvement, Danuohei villagers also actively participate in the excavation and documentation of traditional knowledge. More recently they have received digital cameras and camcorders from the Bureau to record cultural events such as the Mizhi Festival. In addition, representatives were chosen by Yunnan University as village diary keepers to write their own ethnographies. A village museum was also built to exhibit the history and culture of Danuohei and the Sani people. In recognition of its achievements, Danuohei Village was chosen as one of the field study sites of the 16th Congress of the International Union of Anthropological and Ethnological Sciences (IUAES), held in Kunming in 2009. This has greatly promoted cultural confidence and pride among Danuohei villagers. It remains to be seen how the community-driven, multi-stakeholder approach can generate the same effect in other parts of Shilin. It is hoped that with growing confidence in traditional cultural norms and institutions, local communities will continue practising stewardship of sacred groves as a way of life and spiritual pursuit. These kinds of informal conservation practices deserve more support from research institutes, government agencies and other stakeholders. Sacred Groves Sustain Bio-cultural Richness in Yunnan Stone Forest by Hongyan Gu is licensed under a Creative Commons Attribution-NonCommercial-ShareAlike 3.0 Unported License. Hongyan Gu is a Japan Society for the Promotion of Science (JSPS) postdoctoral fellow at the United Nations University Institute of Advanced Studies (UNU-IAS). She holds a Ph.D. in government and international relations from the University of Sydney. Hongyan’s research interests lie in the intersection of environmental history, politics and sociology of knowledge. Her current research project explores the role of forest-related traditional knowledge in biodiversity conservation in southwest China. Xueli Chen teaches visual anthropology at the Centre for the Studies of Ethnic Minorities in China’s Southwestern Borderlands, Yunnan University. His research focuses on the ethnography of the Sani people living in the Shilin County, as well as the preservation and succession of traditional ethnic culture. He has produced numerous acclaimed documentaries about ethnic minorities in Yunnan. Some of his work has been screened at anthropological film festivals in Germany and Norway. This is an extraordinarily heartening piece as it beautifully articulates the dangers and – so refreshingly – the possibilities, for preserving critically important traditional worldviews and stewardship practices. Three cheers to all involved in the Minzu Wenhau Shengtai Cun (Ethnic Eco-cultural Village) proof-of-concept efforts! Your successes are helping show the world that traditional lifeways and sacred relationships to the land are inextricably tied to ecological – and global – health and well-being.